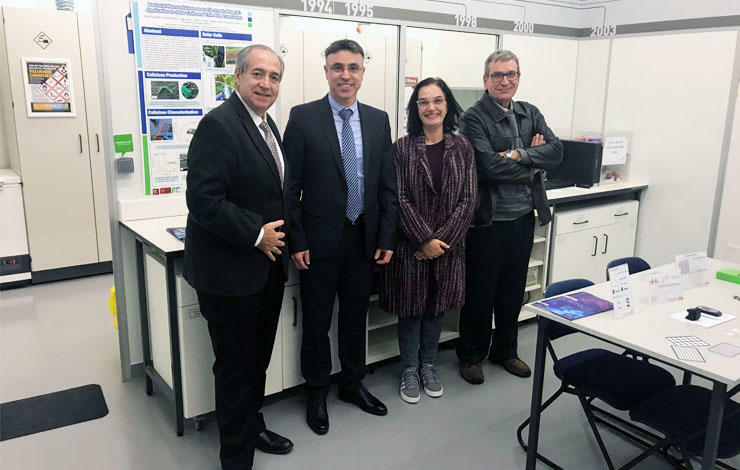 On the last 21st November, the Israeli Ambassador to Portugal, Raphael Gamzou, together with Prof. Hossam Haick of Technion University, visited one of the FCT NOVA research centers. The visit focused on CENIMAT | i3N, particularly in the area of ​​Advanced Functional Materials and Nanotechnologies, with the objective to establish collaboration between the two institutions. Prof. Hossam Haick is a specialist in the field of nanotechnology and diagnosis of non-invasive diseases. He has more than 170 publications in high-level journals in the field of nanotechnology and advanced and applied materials and in the area os chemistry. Prof. Haick has more than registered 28 patents for his inventions. The research interests of Prof. Haick include nanoparticle devices for screening, disease diagnosis and monitoring, nanomaterial-based (flexible) chemical sensors, electronic skin, respiration analysis, volatile biomarkers and electronically based molecules. Of note is the fact that the State of Israel is considered a "Start-Up Nation" and, in this context, such this type of collaboration is also very important for the area of ​​entrepreneurship.